Visitors remark that tasting with Alfred and Rolf Merkelbach at their home in Ürzig, at the base of the Würtzgarten, is to travel back in time. Not much has changed in over 60 years, including the brother’s approach to winemaking. The lists of wines on offer are typed up on an old typewriter and are poured into wide brimmed, tall stemmed, crystal glasses. While visitors might taste and make use of the spittoon put out, the brother’s sip, swallow, and smile. The Merkelbach’s speak a Mosel dialect of German that many people outside of the region (and even some Moslaners) find hard to understand. The conversations and tastings are always punctuated by their laughter, seated on one side of an old round table in the sunny front room of the house, which serves as their tasting room. It is in this house, which has been in the family for 7 generations, where the Merkelbach brothers were born and have lived for their entire lives. Tastings with the brother’s is deliberate. Nothing is rushed or hurried. It is an analog experience, a respite from an increasingly digital world. There is a kind of old wisdom and deep vitality in both the people and the wines. 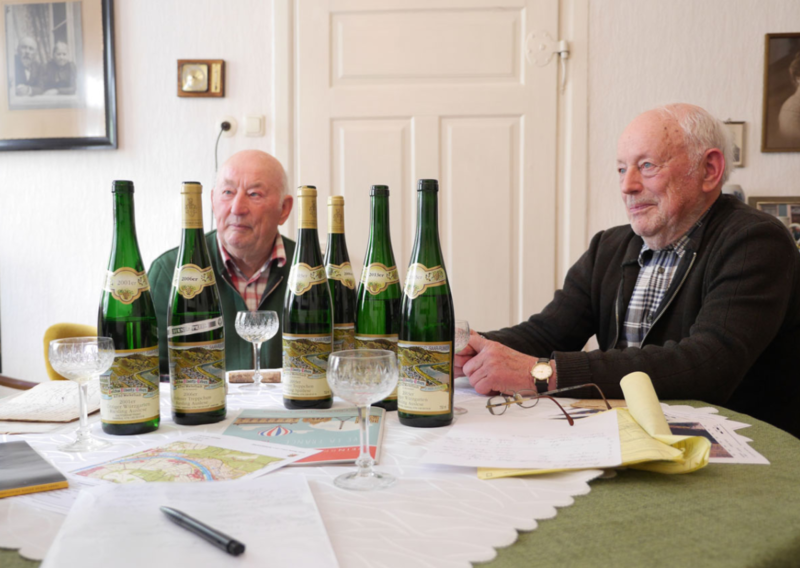 The Merkelbach brothers represent the beating heart, the soul of the Mosel. Alfred Merkelbach Jr., the elder of the two was only 14 years old when he took over the estate in 1951. His father fell ill and Alfred left high school to take over the family business and shortly after, his younger brother Rolf followed. Their fatherwas never able to return to the winery and passed away several years later. In the 1980s the brothers were able to increase their holdings from under a hectare to almost 2 (!) by purchasing excellent parcels from the Richard Jos. Berres Estate, a founding member of the VDP. 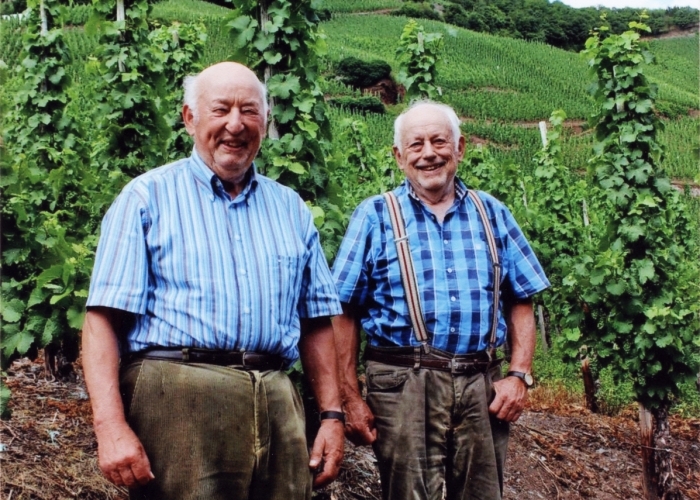 Now well into their 70s, the brothers Merkebach continue to farm just over one hectare of high density, single pole trained and ungrafted parcels in Ürziger Würtzgarten and Kinheimer Rosenberg, with very little help. These holdings are top parcels each one is picked en bloc, in the old way, without multiple passes through the vineyards to select different levels of prädikat. Vineyards are harvested when the whole section is deemed ripe by the Merkelbachs. The grapes are harvested, pressed and fermented in traditional Mosel Fuder (1200L oak casks) and bottled when the wines “are ready”. Analytics come after the wines are bottled, not before. 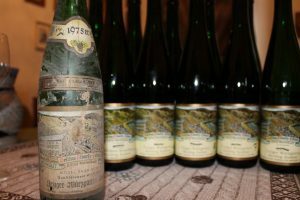 They are ur-Mosel Rieslings; what these wines tasted like in this area decades ago. They are pure and honest, possessing an effortless balance between fruit and mineral elements. Why we should feel such affection for these wines? It’s complicated to pinpoint the singular “why” as there many reasons that we might feel a connection to a wine or person which can be difficult to enumerate. These wines are extraordinary as they are firmly rooted in place, anchored in this bend in the Mosel and to the brothers themselves. The wines are transportive and serve as a reminder of what wine can taste like. Or what Mosel wine did taste like decades ago when work was still being done this way. But here the wines still do – they are living reminders of the past. 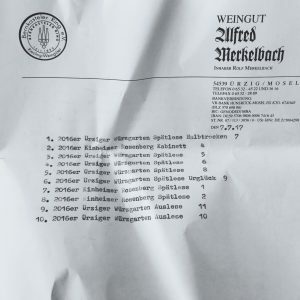 Drinking Merkelbach can be a profound juxtaposition of an experience that is firmly anchored in tradition and place, while remaining humble, and alive. These wines are a reflection of their makers. Can’t resist—a dry Merkelbach that works! Wonderful, gravelly, detailed, a mosaic of sassafras and slate; balanced and savory and fibrous; lithe and slim but long and transparent. The only Kabinett this year. It’s perfect. Nothing else needs to be said. Slate-slate-slate-slate-apple-slate-slate-slate. Salty too, and sweeter than usual, until the final drying blast of slate. An incredible portrait of Uerzig slate, in a salty kiwi-wash that defines the very soul of the being. The parcel is called Vor das Pichter, and everything about slate and Riesling seems to quiver and buzz. A sweeter fragrance is entirely euphoric. Out of words again. More fruit here. Salty-slatey-limey. Gorgeously piquant on the finish, like kiwis in a slate quarry that explodes into an all-permeating dust. This is precisely the aroma commonly ascribed to Würzgarten, and that we also see in Christoffel. It’s slimmer and spicier now; the mineral is not so fulminant; the funky iris florals wouldn’t shock you to find at Nigl. It’s more refined than its brother fuders; the acidity shows more (but is hardly blatant) and it’s a bit more vampy. The Mosel tabula rasa. I thought of my friend Karen MacNeil and the classes she teaches, and beamed a bat-signal to her: KM! You need only one wine to show Mosel to your students, and this is it. This is cooler, even slatier, and finer now—this is classy Riesling and not just “for Kinheim.” The purest apple! Swollen slate is almost smoky on the finish. This could be the greatest Merkelbach wine ever, from a “normal” vintage. A searching, almost unfathomable fragrance does not prepare you for the miraculous palate; fruit and botrytis recall the 2005 but this is slinkier and more incisive, more resinous and herbal and even tropical; tender and powerful. Suddenly exotic, a parfait of black cherry and gold raspberries; the texture is creamier but the wine’s not patently sweeter, it’s just an alternate profile driven less by slate per se and more by fruit compote. Do you know those autumn strawberries, the mara de bois? This wine smells exactly like those little sweeties, at least until the kiwi and licorice rushes in, and the slate and lime blossom, or rather something like a floating pollen of lime blossom. The wine isn’t riven with acidity but the flavors are like an agglomeration of spores that create a flavor layer that quilts the palate.